Surprisingly a number of Chevy Volt electric cars are being driven by Duke University Students. A number of them being charged at a GE station near Duke Chapel. Despite the news of NHTSA investigation about Chevy Volt battery related fires, which seems not really GM's fault, but a lack of following protocols - we were surprised to see how the young students and the academia is embracing Chevy Volts at one of the nation's top universities. 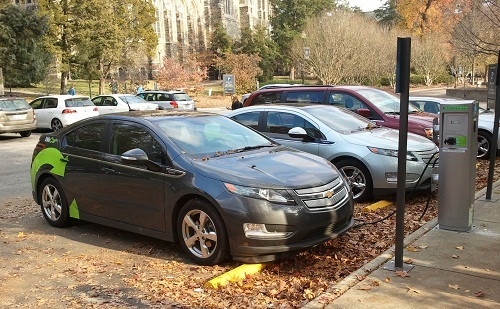 Last week, TorqueNews visited Duke University and spotted three Chevrolet Volt cars being charged on a little street in the University campus. Seen in the accompanied picture, they were parked outside the covered parking lot and were in the process of being charted while the owners were probably in class either teaching or studying. Two GE stations serviced the charging. On one side of the street was the huge and historic Duke Chapel, on the other side were the three Chevy Volts: a sign of the future electrification of the auto industry, which Mark Reuss, the president of GM North America called the auto industry's "moon shot." It was indeed good to see that the best and bright minds in nation's top universities not only craving for the latest tech gadgets like Apple's iPad and Amazon's Kindle, but also are on the forefront of the auto industry's "moon shot." Students and the academia embracing cars like Chevy Volt, Nissan Leaf and Mitsubishi i-Miev sends a strong message that the electrification of the auto industry, its "sputnik moment" is nearing month by month, day by day, helping the environment and reducing the world's dependence on oil.